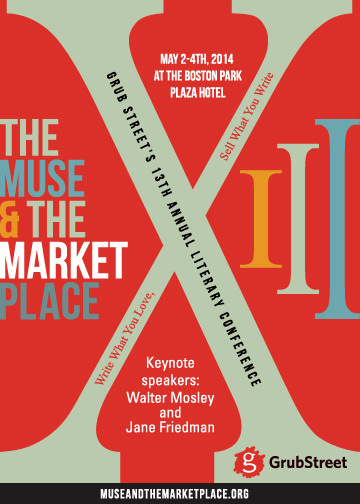 Last month, Literary Arts partnered with Grub Street in Boston and sent two of our 2014 Oregon Literary Fellowship recipients, Robert Arellano and Sarah Marshall, to Boston for Grub Street’s Muse and the Marketplace conference. The next day, at Grub Street’s Muse and the Marketplace conference, I told people about many good things happening in Oregon letters. I talked about the writing community around Literary Ashland, the title of an excellent and open blog edited by my friend and coworker Edwin Battistella, whose new book from Oxford University Press is titled Sorry about That: the Language of Public Apology. And I told people about Literary Arts, Oregon’s community-based nonprofit literary center, whose mission is simply (and ambitiously) to engage readers, support writers, and inspire the next generation with great literature. If you live and write in Oregon, you need to know that the deadline to apply for the 2015 Oregon Literary Fellowships is on June 27 this year. And wherever you hail from, we’d like to invite you to Portland in September for Literary Arts’ 30th birthday celebration, an evening with Elizabeth Gilbert & Calvin Trillin at the Arlene Schnitzer Concert Hall. Oregon needs Massachusetts. And Boston needs Portland. We’re sister states, in a way, mirror cities on the continent, and spiritually connected in areas we’re just beginning to explore: in rich literary and cultural traditions; as incubators for youth and innovator opportunities; by injecting the arts into technology education, thereby turning STEM into STEAM. And finally, permeating it all, in our love of good stories, and of the people who bring them to life. You can read more at Grub Street Daily.